We love October. The leaves are falling, everything is pumpkin-flavored and, oh yeah, season 9 of The Walking Dead hits AMC. That’s right, the new season begins Sunday, and thanks to new showrunner Angela Kang, expectations are higher than they’ve been in years. Finally. In fact, there are at least nine things we need to see in order to keep watching. We know that the newest season begins 18 months into the future, following the fall of Negan (Jeffrey Dean Morgan) and that the people of The Hilltop, Alexandria, and leftover Saviors having been rebuilding, seemingly in peace. And then something changes, of course. Have a look at some of those changes we hope to see. When Rick Grimes actor Andrew Lincoln announced he was leaving the show earlier this year, we figured it’s all over. It’s hard to imagine The Walking Dead surviving without its hero. There’s no question this departure will be Kang’s biggest challenge. So how will she handle it? 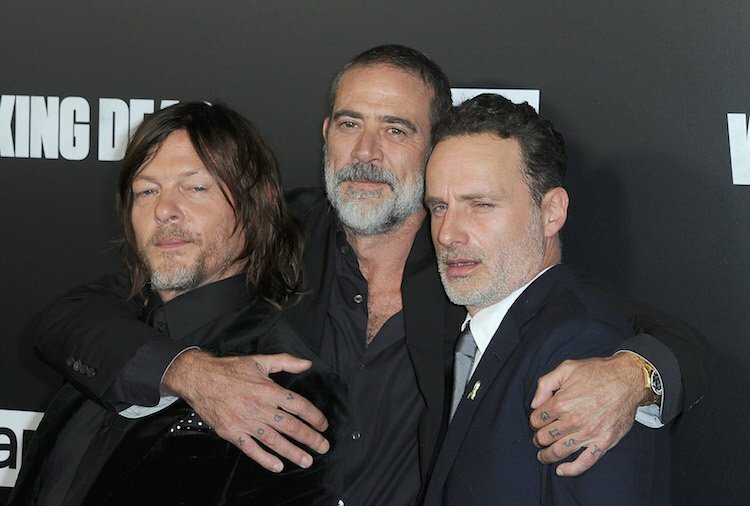 “It’s a good exit…It’s befitting of Rick Grimes,” said Jeffrey Dean Morgan to Access Hollywood. If it’s such a “good exit,” we’d like to see Rick leave with a purpose: an escape to a burgeoning society up north, an underground bunker to a new CDC headquarters to help find a cure, possibly we see Rick hop on the mysterious helicopter we saw in season eight. Keeping Rick alive and having an open-ending exit ensures we could still see him for a return upon the series’ conclusion, whether that be months or years from now. Whether or not Rick gets on the chopper doesn’t matter too much as long as we finally get an explanation for the vehicle. Raise your hand if you’re tired of stay-at-home Carol? She has one of the most fascinating arcs on the show (went from being battered, insecure wife, to rock-solid, dependable, hero). And she’s a fan favorite for a reason. We saw the “old” Carol start to emerge again at the end of the last season. We need to see more of that. It’s time to see the clever female leader rise up again and take down some bad dudes in season nine. No more baking cookies, Carol! Season eight concluded with Maggie (Lauren Cohan), Daryl and Jesus having an interesting chat, conflicting with Rick’s decision to keep Negan alive. Could Maggie be gearing up for a civil war? Or is she just ready to take the bull by the horns? Cohan’s role will be used sparingly this season because of another TV show she’s working on. So I encourage Kang to leave her role open-ended as well. I’m not sure the show can survive both a Rick and Maggie death in the same season. We got to see a glimpse of this demise in the season’s opening-five-minute teaser. We bet something important is found in D.C. at some point this season. But at the very least, we want to see The White House look like it was taken over by some deranged psychos. That’d be weird, wouldn’t it? It was an unprecedented and stunning move to keep Negan alive in season eight. We get it. Rick wanted to honor Carl’s wishes, and Jeffrey Dean Morgan is too great of an actor (and epic antagonist) to kill off the show. But although he’ll be locked up this season, can we at least see him suffer? Negan is the absolute worst. There’s no way Maggie lets him live comfortably after how he killed Glenn, right? Right!? Spoiler alert! Shane, another of the best/worst antagonists, is supposed to make a reappearance in season nine. Since Carl killed zombie Shane in season two, I’m assuming he will appear in one of Rick’s flashbacks. But as much as we hate the fact he knocked up Rick’s wife the second the zombies took over and killed innocent people, it will be good to see an old face from the start of the show. Maybe he ties in with the “before” storyline that has to come eventually. Thanks to the comics and the Instagram post above, it looks like we may be on the verge of seeing a new antagonist that will make Negan look like the tooth fairy. The Whisperers is a group of survivors who hide underneath the skin of walkers, allowing them to roam with the zombies undetected. They’re gross. But they’re also scary because they’re hard to spot. And their leader, “Alpha,” impales the heads of her victims on spikes. Awesome. There have been castings announced tied to roles regarding the Whisperers. I’m excited to see what it all means for the new season. Fewer guns. More karate. Jesus is a total badass in the comics. It’s time the show showcases more of those hero ninja moves.